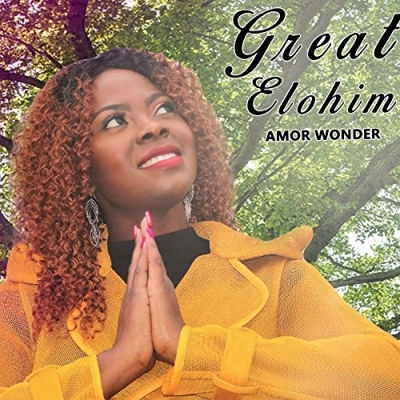 Gospel singer/songwriter Amor Wonder recently released her new single 'Great Elohim'. LTTM spoke with this talented artist to find out more about her inspiration and musical influences, plus her plans for the future. For those who haven't heard of you before, can you tell us a bit about yourself and how you got involved in making music? My names are Amor Ebot, a Christian, praise and worship leader, song writer/recording artist. I was born and raised in Cameroon, to a Cameroonian father and Equato Guinean mother. A graduate from the University of Buea, Cameroon, with a Bsc in Management, I am passionate about music, fashion designing languages (I actually speak French, English and a little Spanish) and helping the needy. Music and singing have been part of my life as far back as I can remember; singing at my leisure time and being involved with my church choir and acapela groups. At some point I felt there was more in me than singing other peoples' songs as a chorister, which without any doubt always blessed the people I would minister to, but still I felt there was more to be expressed and my family and close friends saw that too. Way back in High school and College I started writing down lyrics I would hear in my head and humming the melodies, but then i would forget most of them, because never really took it seriously then. One of the very first i wrote was a wedding song, which thank God I still have. That will come in handy to me very soon, lol! Not until more recently after dedicating my all to serve God in 2015 that I finally found myself in Him. Being a praise and worship leader at my church brought a plus to my closeness with God and it became so clear to me, and evident to everyone around me that this is one of the things He created me to do; making music for His glory, music that would bring a deeper revelation of who He is by the power of His Holy Spirit and His word, bringing healing and upliftment to the broken. Being in close fellowship with Him, I could hear Him clearer and hence it made it easier to write the kind of songs He wanted. I was so convinced this was not me, it was simply God and there was like a weight in my spirit, something in me that needed to burst out for the world to see and hear. Besides hearing Him and having personal convictions, people around me who had me at heart,family and friends, especially my brother, his wife and my mother kept pushing me. My Pastor saw this call of God upon my life kept praying for me. I received quite a number of words of prophesy and encouragement from fellow Christians and Pastors to confirm this. It weighed heavily in my spirit, God was talking to me, asking me to pick up this assignment. After my Spiritual Father spoke over my life earlier this year, in January 2018; I felt propelled unto this path of christian music. I had never felt so inspired my whole life, and in less than two months, I realised I had actually written 7 complete songs; among which was my single Great Elohim, and I found myself in a recording studio in March to record this great song! Tell us about your new single 'Great Elohim' and the meaning behind it? My single Great Elohim was dropped in my spirit on this day I still remember. I was in the kitchen making lunch and as usual I was singing songs of worship and I stopped for a minute and I just began to gaze upon the greatness of God, the universe He created, in six days and all that He is to us His children. Suddenly there was this feeling in my heart I cant really explain but I wanted to tell God all that He represented and I felt the need to have everyone join me in this. I didn't seem to be able to find a song to express that and all of a sudden I heard this beautiful melody in my mind, and I began to sing, I can remember singing and the words of worship just kept flowing like they would never stop. I was moved to tears while I sang and the melody was so beautiful and soul searching, it connected to my spirit immediately and then I thought to myself, I need to record this on my phone so I won't loose it. I did, but I lost that phone, lol with the recording! I felt a little frustrated because I could only remember how beautiful the song was, that was it, it was gone from my mind. Little did I know God himself had "downloaded" this song to my spirit. I sat down one day to write and I began to hear a familiar melody in my head and the words were coming and I began to sing and I knew it was my song, I never lost it! This was how I wrote this song, which I later on titled GREAT ELOHIM. I worked on the music and arrangement with my brother Mild and sister in law, Bess, who happen to be choristers too and musically inclined; and thank God we found a producer, Junior Lee who just blended in and connected with my vision of this song. The entire arrangement, recording, with life instrumentation and production was done within 3 weeks. Thank God for His mighty hand upon the project and for using Mild and Bess who worked tirelessly to see this dream come true. By the first week of April, Great Elohim was out on most digital music outlets. It is a contemporary worship, 6 minutes song, with life instrumentation. Above all, It is a song inspired by God Himself backed by His Holy Spirit and based on His Word! The song Great Elohim is simply my expression of who God is in a few words.Words could fill the whole earth and beyond but still would not describe Him enough. It is a call to the whole universe, to people from every tongue and tribe, race and religion, to acknowledge the omnipotence of the one and only true God, the God of all creation, the Great Elohim! Do you have any plans to follow this up with a further single or album? Yes I am currently working on an EP, which should be out there in the next few months. If you could work with any songwriter, who would it be and why? There are quite a number of them, but I would say; Tasha Cobbs and Jekalyn Carr to name a few because of the power their songs carry which are evidently backed by God's Spirit. Also Travis Greene, Shana Wilson, Nathaniel Bassey and Elevation Worship because of the depth of their worship. How would you describe your style of music and what are your influences? My style is a little hard to situate... I would say it's a blend of inspirational Christian Gospel / Praise and worship, contemporary worship, country , soft rock, Afro beat and more. Basically it is a blend of all the different styles of music I listen to. My music is being greatly influenced by my background. I am African and grew up in a family where everyone loved music and we listened to all styles, from country, r n b, afro beats, rap, traditional gospel, hispanic beats (because of my moms origins), etc. I grew up listening to Dolly Parton, Kenny Rogers, Micheal Jackson,Whitney Houston, Brandy, Marriah Carrey, Aretha Franklin, Cece Winans and much more. As I got closer to God, I became more selective with the music I listened to. Plus i became a worship Leader at my church, Omega Fire Ministries, MD. This was how i became more familiar with different worship bands like Hillsong, gospel artists like Tasha Cobbs and Sinach. I discovered that despite my afro roots and entourage, I strongly gravitated towards the Hillsong and soft rock genre of music. This made me fall in love with the Doulos worship band of Cornerstone Church in Bowie, which I had the priviledge to join last year. All these experiences have influenced the music I make but my number one influence remains God's Spirit and His word. How would you define success in your career as a singer? To me as a Gospel Singer, success is reaching the uttermost parts of the earth with my music and seeing lives transformed by the power of God's word and Spirit through the music and songs I sing. I don't have one favorite album, it is hard to pick, there are so many! To name one I would say Alpha and Omega by Israel and New Breed. You're stuck on an island, it's hot, you only have enough battery life left to listen to one song on your mp3 player. What track is it? What does the next year hold for Amor Wonder? For next year I'm still planning and praying to see where God wants to lead me but I am envisaging starting work on a second EP and many concerts out of the country because the praises of our God, will and must get to the ends of the earth.